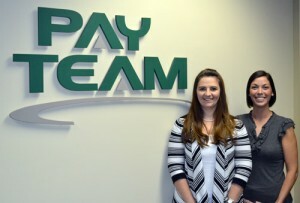 Payteam is the payroll processing expert for small businesses. We ensure an efficient and accurate payroll process combined with our experience and service, allowing our clients to focus on their most critical task, building their businesses. Who has time for payroll, tax deposits, keeping track of confusing and ever– changing government regulations? If you are like most small businesses, you can’t afford to take time or focus away from your bottom line. Our payroll services are simple to uncorporate, eliminating frustrating complicated issues. Payteam manages the entire payroll process allowing you to focus on building your business while maintaining accuracy, reliability, as well as control over the payroll process. With Payteam eliminate labor intensive manual entry or rigid computer programs that demand an enormous amount of your time. Let the experts handle it with a predictable and cost effective service, at a low monthly fee. Payteam’s full service payroll solution includes vacation time tracking, tax calculation, tax filing, W-2 issuing and direct deposit. We offer efficient tools for account management, including customized monthly and year end reports, an electronic copy of all reports at year end, as well the ability to manage your account through remote access. Maximize your business while simplifying your effort. Have a proud history of client satisfaction that underscores our service, accuracy and reliability for all businesses, no matter the size, industry or location. © 2011 PayTeam. All rights reserved.